From the late 1980s until the early 2000s I researched and wrote widely on the effects of technological change on work relocation, and in particular in the issue of telework. My writings from that time remain available here for the time being. The report The Global Mobility Revolution, written (late 2003) for Union Network International, proposes a policy and an approach for trade unions internationally facing up to the issues of 'offshoring' and the remote migration of work. PDF format. Also available in French, German, Spanish and Swedish versions. This web site includes a lengthy extract from my book "Home is Where the Office is: A Practical Handbook for Teleworking from Home" (publ Hodder), examining the advantages and disadvantages of changing to teleworking. This book was the first practical guide to teleworking to be published in Britain and, although written twenty years ago, some sections of the book remain still relevant. The booklet Working Anywhere, published by the UK government's Department of Trade and Industry, had useful case studies and practical information for British readers (2nd ed, 2000). I have selected a number of extracts from the book "Teleworking: Thirteen Journeys to the Future of Work", (publ Calouste Gulbenkian Foundation, 1995). This book is now primarily of historical interest. 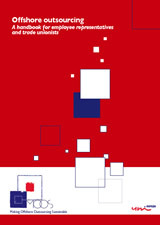 The complete text of the report Teleworking and Trade Union Strategy, is available. This report was written in 1996 for FIET, now part of UNI. Available in German: Gewerkschaften und Telearbeit. This report is now primarily of historical interest, as the first document to explore union responses to the developing trend of teleworking.